4" stretch and 4" drop got the hardtail kit off E bay. guy from kansas city. nicely tig welded. was a easy conversion. Really bitchin' old school chop...love it! 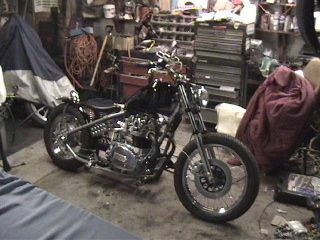 Good lookin' chop...heard good things about those rigid tails. I think its junk...can I have it? Sweeet! what did you use for carb/air filter conversion?